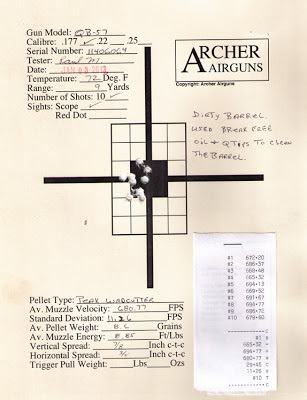 Archer on Airguns: Barrel Cleaning - It Works! OK, I admit it! I've never been a great airgun barrel cleaner, I've just never considered it necessary. But, maybe I've been wrong - at least some of the time. Recent discussions on the Chinese Airgun Forum have caused me to change my mind a little. Well, actually Paul - who performs most of the Archer Airguns Gold Service tests on spring/piston air rifles - tried barrel cleaning under controlled conditions. He was testing a QB57 air rifle, which are usually very accurate, for a customer order and the accuracy for the gun was just not there. So, he cleaned this particular barrel with Q Tips saturated with "Break Free" and pushed through the barrel with a thin wood dowel. The images below show the results he obtained. 1. Here is the performance of the QB57 with an uncleaned barrel. 2. 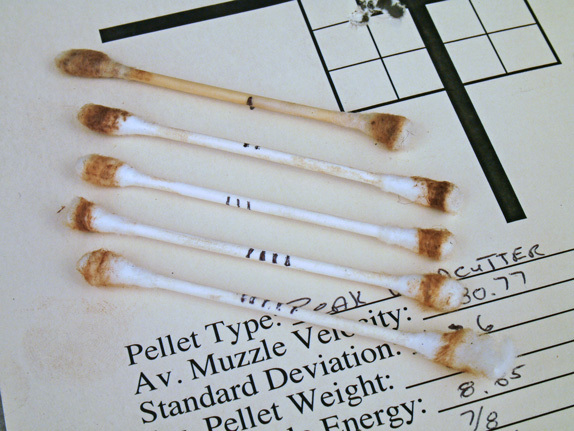 We see the resulting Q Tips from Paul's cleaning activities. He marked them so that you can see the progression in cleaning. The first is at the top, the last - when the barrel looked truly clean - is at the bottom. 3. 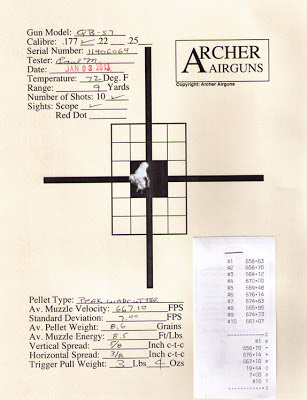 Here is the test target that Paul re-shot after cleaning. There's a huge improvement! 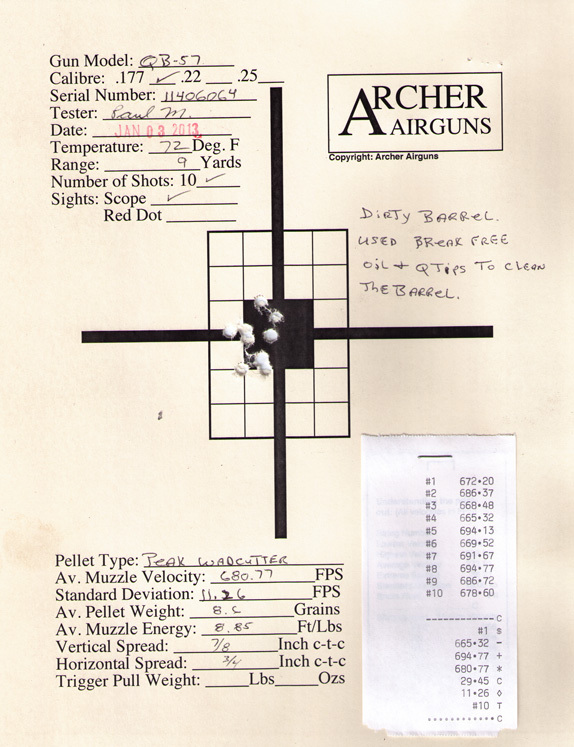 Note that this was done by the same shooter, with the same air rifle using pellets from the same tin and shooting immediately after the first target. The group shape was approximately the same in both cases, but the one achieved after cleaning was much smaller. Yes, this is just one test, but I'd say that it certainly supports the contention that barrel cleaning is good for accuracy with airguns - at least occasionally and especially when the gun is new. Thanks to Paul for his efforts and initiative in producing these results!